I never hear people talking about strawberry pie. Well, I’m here to tell you it’s awesome. Dab a little whipped cream on top of that baby and you’ve got yourself an awesome dessert. For Easter, my ma made a strawberry pie with jello that is a little different than straight up strawberry sauce and maybe a bit lighter as well. Here’s a recipe if you’re feeling pie-happy. ← Celebrité: Alec Baldwin has a French-Canadian stalker. That’s it, everything’s been done. 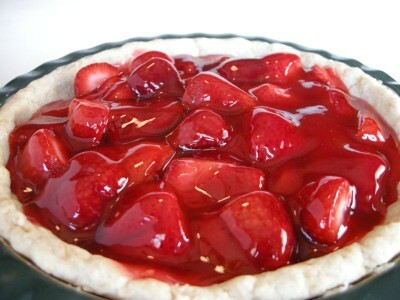 my brother makes a great strawberry pie with white chocolate. try it!